As part of our Quality Control process we periodically check production forks against the same ISO 4210-6 test standards that we use during the R&D behind each part or product. The process covers both fatigue and impact testing and is very noisy. Fatigue testing involves the application of force with rapid repetition perpendicular to a fork’s axle, to simulate a lifetime’s worth of washboard roads and uneven pavement. Impact testing is meant to show the result of a sudden application of a singular force — like an impact with a curb or a car in the real world — with the goal of preventing a catastrophic failure that would leave the fork completely broken. The sweet spot is of course in having both the resilience to live a long life in the face of relentless road chatter and a stout construction that, in the case of a sudden and very hard hit, will absorb energy and remain intact to function as designed until a controlled stop can be made. Our forks are tested on the Oregon Bicycle Constructors Association Fork Smasher (official title) and take several hours to complete. Watching the machine run one can’t help but nerd out, and watching the cycle counter roll up to and over 100,000 repetitions during the fatigue test is pretty satisfying. Did we mention it is noisy? It is also satisfying, in a far more giddy way, to take a fork that has already gone through the 100k cycles of the fatigue test and watch it pass the rearward impact test. The impact is violent and can easily destroy any under-built fork of any material. (There are different test regimens for suspension and rigid forks, but no distinction in criteria based on materials). We recently pulled one of our TiGV titanium production forks from our regular QC process to run through the full battery of abuse from the Fork Smasher. This particular fork had been tagged for a couple of cosmetic issues that were extremely mild by most standards but were enough to tickle our OCD, and we were curious to find out if they would have any functional effects. Reminder: The machine makes a lot of noise! After completing both test cycles we pulled the fork off of the machine and gave it an inspection. We were pleased to see that the design had functioned perfectly, taking the marathon pounding of the fatigue test like a champ and then absorbing the force of the impact test squarely and without catastrophic failure. The gentle fold deformation at the point where the fork leg curves into the tapered crown is the only resulting damage, and is the exact failure mode we would want to see a rearward impact situation — less than 45mm of permanent deflection with the axle/fork legs remaining perpendicular to the bicycle centerline. On the topic of changing, non-standard “standards” in the bicycle industry, we share consumer frustration with the wasteful and short-sighted practices of proprietary dimensions, limited functionality, and planned obsolescence that large component companies engage in. The existence of multiple front axle dimensions has been one of those frustrations. For using 15TA front hubs/wheels with 12TA forks, the PDXTI-12-15-TA Adapter provides a simple, inexpensive, and lightweight solution. Going the other direction — using 12TA wheels with a 15TA fork — is however not as simple. 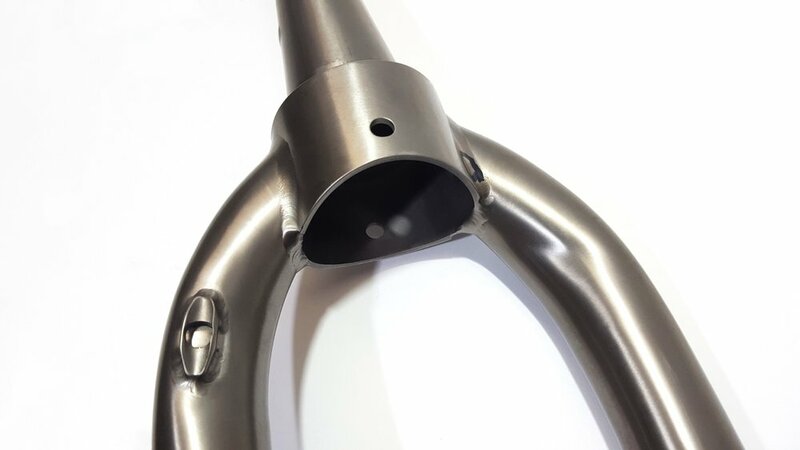 Thankfully, we are now able to offer a solution for cyclists with one of the many titanium and steel forks that have been built with Paragon DR0049 titanium or DR2051 steel and similar 15TA front flanged/hooded dropouts with threaded axle inserts. Developed in collaboration with PDXTI and now available in the web store, these threaded fork dropout inserts convert titanium and steel forks with the aforementioned 15TA dropouts into 12TA forks. At its base this product consists of a pair of externally threaded left hand M22 x 1 inserts, one with a 12mm thru hole and the other internally threaded M12 x 1.5 for 12mm Thru Axles. Available as inserts only, with traditional QR lever axle, or with lightweight @robertaxleproject thru bolt. Heads up for those interested in our titanium production forks — We currently have all models available, with regular re-stocking orders continuing through the fall. New for 2019, we have redesigned our TiGV and TiPAK titanium production forks to utilize the same unicrown construction as the Ti29+ and TiFAT titanium production forks. The result is a stiffer, lighter, generally more durable fork that has a more refined look than the segmented design. Not sure what the difference is? See the image below. Definitely sure what the difference is and have your heart set on a segmented fork? Or maybe you’re looking for the perfect mate for a 9QR frame and wheelset you already own and want a quick release TiGV fork? Or you want to use panniers with your Ti29+ fork? No problem! We are now offering a SEMI-CUSTOM option for all of our forks, meaning you can dial in your part with exactly the features you want. Along with the redesigned crown we have also updated the logo graphic for titanium forks, switching to a single Matte Etched chevron on the drive side leg for a cleaner, more minimal look. And as always if you’d like paint, powdercoat, or anodized and etched graphics we are happy to do that for you under our SEMI-CUSTOM program. Whether you are cruising recreational trails like the Banks-Vernonia, pushing your limits racing in the Oregon Triple Crown series, or navigating your hometown streets on the commute to work, the TiGV fork will suit you well. True story: The TiPAK fork’s biggest fans are Salsa Fargo owners, folks converting 29er hardtails from trail bikes to adventure rigs, and bike touring aficionados. Rutted and washed out 4x4 roads. Flowy singletrack. Lost Coast beach rides. Game trails. The Ti29+ is ready when you are. From Point Barrow to Pismo Beach and every sandy, soggy, boggy, muddy slice of heaven in between, there are few human powered pursuits that rival ripping otherwise unrideable terrain on a fat bike. Get some, and then some!